By Xah Lee. Date: 2017-03-28 . Last updated: 2018-04-14 . 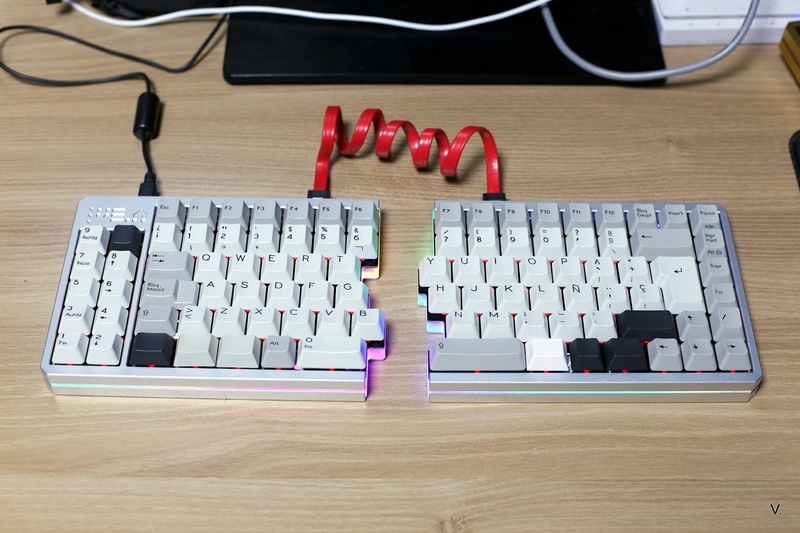 The VE.A keyboard is a nice and expensive Do It Yourself keyboard. Totaly key count: 96 keys. • Mechanical keys. Available in Cherry MX choices or gateron switch. • Split. 2 spacebars. You can program one of them to some other key. • Full F1 to F12 function keys. • 10 extra programmable keys on left edge. • Wrist pad, and tenting base, optional. SATA cable joining the 2 pieces. 1.5T STS switch mounting plate. About $450 on massdrop. Not readily available. And you have to build it yourself, including soldiering the electronics. VE.A's got 10 extra macro keys, and driverless key programing. Those are killer features. Plus, full F1 to F12 function keys, and arrow keys etc. And split space bar, and many thumb keys. But at $450, plus you have to assemble it yourself, then it's not worth it. Lots other keyboards have better value/price ratio. and buy a good programable keypad for $80. that gets you dedicated arrow keys and function keys.